Finally some photos from this year! I have recently scrapped so many photos from last year (and some from the year before!) and am happy I have some of those memories done before they start to blend into this years. But in saying that its nice to start scrapping this years memories now!! We went to visit some Christmas lights on the weekend and have plenty of fun photos! 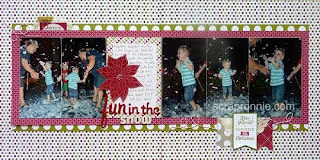 Materials: Season of Style DSP (132340), Season of Style Journaling Tags (132808), Old Olive Simply Styled Embellishments (132148), Naughty and Nice Rotary Stamp (132278), Joyful Christmas Stamp Set (131802) Merry Little Christmas Stamp Set (131826), Cherry Cobbler Twine (123125), Tea Lace Doilies (129399), Pearl Basic Jewels (119247), Cherry Cobbler cardstock (121681), Whisper White cardstock (106549), Old Olive Cardstock (106576), Old Olive ink (126953), Cherry Cobbler ink (126966), Choc Chip ink(126979), Whisper White Staz On ink (106960), random letters from my stash.